The new Venus Swirl, designed specifically for women, will debut in US retail outlets Jan. 19. How does the top company in the global razor market improve the age-old shave? 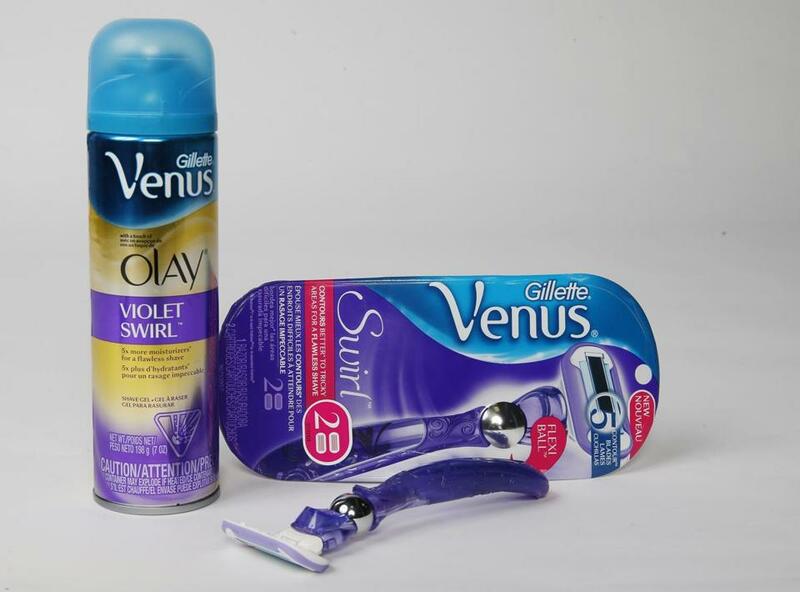 To perfect the new Venus Swirl, Gillette researchers went into women’s homes and watched them shower (in bathing suits). Gillette plans next week to introduce the Swirl, featuring the first major change in its women’s razor since the original Venus was launched more than a decade ago. The razor is five years in the making — time that Gillette spent building dozens of prototypes, observing in-home shaves, and testing the razor on 7,000 legs. The Swirl, developed at the company’s World Shaving Headquarters in Boston, features a ball hinge on the handle that rotates to allow the razor to be in closer contact with skin on the knees and ankles. The cartridge has thinner blades than other Venus models and a tiny plastic comb, which Gillette says places hair at the optimum angle for a smooth cut. of Swirl blades is $20.99. Gillette’s global sales of razors and blades topped $10 billion in 2013, according to Euromonitor International, a London market research firm. Women’s sales reached $1.3 billion. Javier Escalante, a household and personal care analyst at Consumer Edge Research in Stamford, Conn., said that Gillette hopes the new handle will counter the growth of cheap, disposable razors and draw consumers back to more-expensive shaving systems with handles and blade cartridges. Disposables account for about 75 percent of razor sales volume in the United States, according to SymphonyIRI Group, a market researcher. Gillette has a 75 percent share of the blade cartridge market, by volume, but only about 30 percent of the disposables market. Gillette and other mainstream brands are also feeling pressure from e-tailers that ship less-expensive razors to customers through subscription services. Los Angeles-based Dollar Shave Club, for example, has grown to 1.4 million members in three years, according to company officials. Gillette’s strategy, Escalante said, is to offer a handle that is difficult to replicate in less expensive products and that customers find so superior they will pay premium prices for replacement blades. The new razor is the sister product of the men’s Fusion ProGlide Flexball, a razor that introduced a first-of-its-kind side-to-side pivot on the handle. It was launched in the summer. 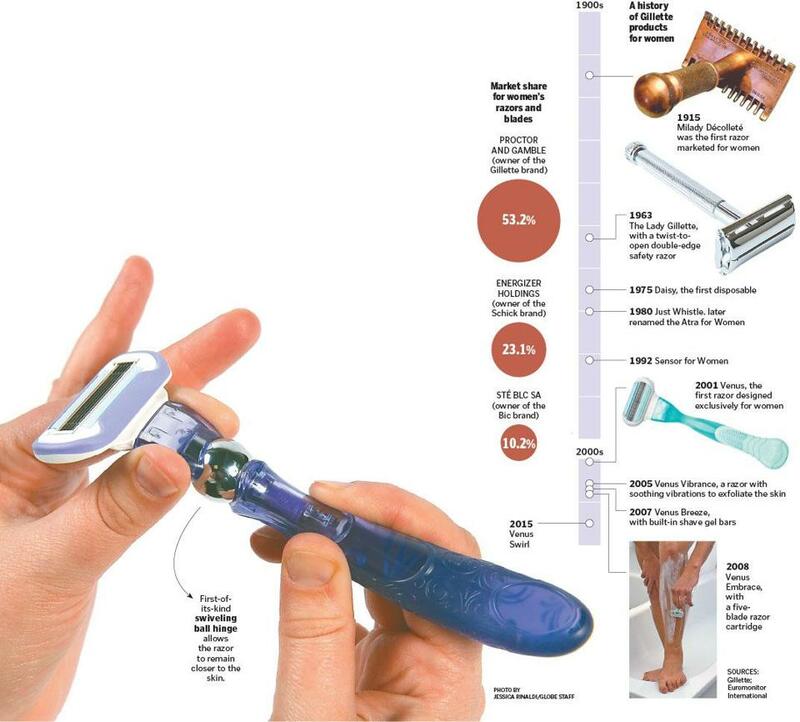 For decades, women’s shaving technology has trailed innovations in the men’s market. King C. Gillette, the founder of Gillette, which is now owned by Procter & Gamble Co., of Cincinnati, invented a men’s razor with disposable blades in 1901. The company did not introduce a razor designed specifically for a woman’s body for 100 years. Many of the razors before Venus were built for men, then adapted for women. Razor makers are less focused on the women’s market because it is less lucrative, since women shave and buy blades less frequently than men, said Ali Dibadj, an analyst at Sanford C. Bernstein & Co., a New York research firm. Worldwide, retail sales of women’s razors and blades reached $2.5 billion in 2013, compared to $13.3 billion in men’s products. Critics have long complained about the so-called “pink tax” — the higher prices on products for women that are similar to the items for men. The Swirl has a suggested retail price of $12.59, while the Flexball debuted at $11.49. The products feature different materials and designs and can’t be directly compared. Over the past few years, Gillette has tried to better understand women’s shaving preferences. Today, its razors and blades command more than 50 percent of the women’s shaving market, according to Euromonitor International. The company began brainstorming ideas for a new women’s razor in 2009 and produced more than two dozen prototypes. Eighteen months later, the team selected one 13-piece razor and tested every detail, from the position and feel of the grips to color to mechanical function. Bill O’Connor, an associate director of product design and development, said computer models measured the amount of force and pressure each blade exerts on the skin. He said a tiny camera was placed behind the blades to film it cutting the hairs. The hinge was twisted 1 million times to determine that it would have at least a five-year lifespan. The Swirl will be available at US retail stores Jan. 19.